During composting, man assists nature by organizing good operating conditions for the micro-organisms, which decompose the waste. The waste is decomposed primarily by the bacteria, fungi, ray fungi and earthworms assisted by a number of most diverse micro-organisms. As a result of the activity of the micro-organisms, water/vapour, carbon dioxide, nutrients and heat energy is being released from the waste. At the same time, organic matter is created, which is important for the fertility of the soil. For nutrition, the micro-organisms in the compost feed on the waste being composted as well as each other. Their vital functions generate heat in the compost. As a result, the temperature of the compost can rise to as high as 70-80 degrees Centigrade, which is advantageous in terms of building up high-quality compost soil. Composting happens in three phases: warming phase, hot phase and cooling phase. The occurrence of the phases depends on the waste being composted and the method applied. In the heating phase the compost is occupied by bacteria and ray fungi. As their nutrition they use the "true delicacies" in the compost, such as sugars and proteins. In the heating phase the compost becomes sour, i.e. its pH-value decreases. Subsequently, the sourness is balanced so that the pH-value of the ready compost is close to neutral (pH 7). 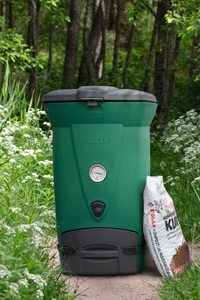 A well-functioning compost heats up to 30-50 degrees Centigrade in a few days. Then the decomposers of the first stage give way. Bacteria and ray fungi accustomed to hot conditions occupy the compost and use the easy decomposing nutrients in it as their nutrition. Thanks to the "cheap energy", the temperature of the compost may rise to as high as 85 degrees Centigrade. The hot phase is also short, at maximum a few weeks. Running out of easy decomposing nutrition is followed by an "energy crisis": the temperature of the compost starts to drop. New decomposers occupy the compost. Then fungi and ray fungi start rotting substances that are difficult to decompose, such as, for example, wood. Familiar mushrooms, such as champignons and inky caps, may grow in the compost. Mould fungi are also an essential part of a well-functioning compost. During the cooling phase other types of life can also be observed in the compost by the naked eye: dung worms, beetles, millipedes etc. The cooling phase lasts a long time, even several months. This is the phase when organic matter starts forming in the compost. The different phases are more distinct, if the composter is filled up in one go. Also in a composter for household waste, which is filled continuously, all the phases are visible in layers of different age.